The lawyer for Abaribe is a Biafran SAN not Alimajiri quota lawyer like the AGF who doesn't know the law he is meant to be defending. Let us see how Binta Nyako the Fulani girl will fly to Owerri then travel through terrible road for that matter, to Isiama Afaraukwu Ibeku. What an experience that will be for the Islamic quota judge. This case will destroy Nigeria completely. Before this matter can proceed, Binta Nyako must visit Isiama Afaraukwu to assess the damage Hausa Fulani Islamic savages did to the home of Kanu. There is something called the doctrine of last seen. The Nigeria Army were the last people to see Kanu alive, so they must produce him. This is simple common sense. Mind you the request for Binta Nyako to visit Abia State is rooted in the laws of the Nigeria for those illiterates who may wish to argue for the sake of it. 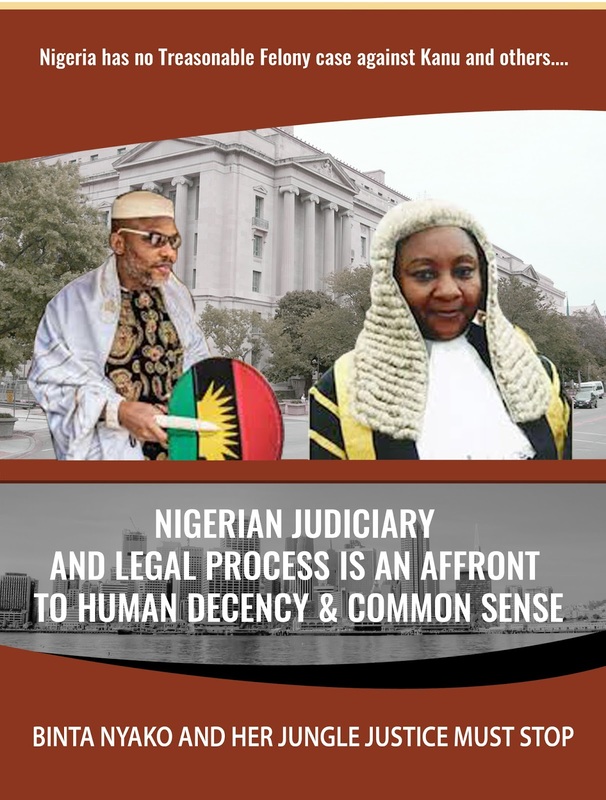 Senator Enyinnaya Abaribe, one of the sureties of the leader of Indigenous People of Biafra (IPOB), Nnamdi Kanu, has filed an application requesting Justice Binta Nyako of the Federal High Court, Abuja to pay a visit to the residence of Kanu in Isiama Afaraukwu, Abia State and inspect the aftermath of the military invasion. The motion dated December 4, 2017, and filed on his behalf by his counsel, Chukwuma-Machukwu Ume (SAN) was brought pursuant to section 6 (6) a) (b); 36 (1) of the 1999 Constitution, and Sections 177 (1) & 179 of the Administration of Criminal Justice Act (ACJA) 2015. The applicant in the motion is seeking an order granting leave of court to visit and make physical inspection of the incidences of the invasion and occupation of Kanu’s residence (at Isiama, Afaraukwu Ibeku Umuahia Abia State) from September 11 to 14, 2017, and the eventual arrest and taking away of Kanu by the Nigerian Army. The motion is predicated on the grounds that Kanu was at his residence before and all through September 11 to 14, 2017 at Isiama Afaraukwu Ibeku. Abaribe argued that the application would help the court and indeed the applicant in the determination of his application before this court. “The applicants application cannot be determined or resolved by mere documents as described on the exhibits before the court but physical inspection of the said property. In an affidavit deposed to by one Deborah Warrie, in support of the motion, the applicant stated that it was out of patriotic consideration of assisting the judicial process to defuse the high tension already generated in the polity and with full convictions that Kanu was carrying on his activities within the limits and confines of the constitution, that Abaribe (applicant) offered to stand surety for Kanu and entered into a recognisance and executed the bail bond. The affidavit averred that since the release of Kanu from prison custody, he was last seen and known to be in his residence at Isiama Afaraukwu Ibeku, Umuahia, Abia State. It was stated: ”That sometimes in 2017 or thereabouts, the Nigerian Army High Command on the instructions of the Chief of Army Staff announced publicly that they were going to commence a military operation exercise code named operation python dance in the whole of South- east from September 15 to October 14. The deponent said the forceful military invasion of Kanu’s residence resulted in frustrating the bail bond of Abaribe. She added that a visit to locus quo would enable the court to get evidence surrounding the facts of the suit. Meanwhile, the application was not moved because the trial judge, Justice Nyako, did not sit, and the matter was adjourned to February 20, 2018.